“My name is Bob Lujano. I am very blessed person because I am employed and compete as an athlete in wheelchair rugby.” This was my introduction as I was on a panel to discuss the role of media and how it portrays athletes with a disability. In regards to this topic there are so many roads that this discussion can follow. I know that sitting at a table and trying to map this out can be difficult. I will try to guides us on a short and narrow road. The first question to ask is to find out what the media wants? What do they want from the athlete with a disability? To me the answer is a sensationalized story. It wants to capture the attention of the masses to make people watch or read. Many titles of the story start out with referencing the person’s disability. What is being reported now are stories on a youth with a health issue making a basket or a person with a downs syndrome scoring a touchdown. There are conflicting issues with this type of portrayal, some good and some not so. First and foremost, I am an eternal optimist, so my initial reaction is this what people want? Is this really all bad? Mentioning or talking about a person’s disability does provide a platform to discuss disability issues in general. Secondly, it also shines a spotlight on disability to the mainstream. Isn’t this good? I think there is a significant amount of fear and anxiety from the public in regards to disability. Seeing it on TV or reading about a person with a disability could hopefully minimize any insecurity. On the other hand, the structure of this type of reporting can be confusing to the viewer. Most of these stories are meant to give the viewer a “warm and fuzzy” feeling. Now, this “warm and fuzzy” category is a very trending and popular topic. However, what it inadvertently does is condition the viewer to possibly develop a mindset that this is how all people with disabilities should be viewed. Go make yourself feel better today, go hug a person with a disability. Therein lies the issue. Many people in our society, including quite possibly the media, do not know or think there is a difference between physical or intellectual disabilities. So, it is easier to just bunch us all together. I wonder how many people that report stories on people with disabilities have ever had any disability awareness training? What about their supervisors? Is there an organizational policy in their infrastructure? Another reporting flaw with the “warm and fuzzy” topic is that many people develop a pity or sensitivity perspective about a person with a disability. I wonder if the mainstream realizes that a person with a disability wants to compete. What? That would mean they could fail, get hurt, or even, God forbid, lose. Oh no, this terrible. However, there is a difference in disability types. There is also a difference between Special Olympics and Paralympics. Special Olympics, which feature athletes with intellectual disabilities, always win. 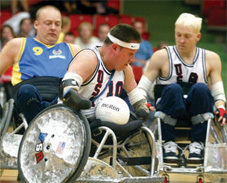 Paralympic athletes, people with physical disabilities, compete and sometimes win and sometimes lose. There is NOT a difference between Olympics and Paralympics. Both Olympians and Paralympians have to earn and keep a spot on a national team in order to win a medal. The similarity lies in competition. Today, there are many outstanding athletes with physical disabilities that train very hard to win tournaments, swim meets, track/road races, marathons, and Paralympic medals. Thank you to Tatyana McFadden, Josh George, Steve Cash, Alana Nichols, Jessica Long, David Wagner, Rudy Garcia-Tolson, April Holmes, Jen Armbruster and Chuck Aoki for their hard work in being top athletes with a disability. It is very hard work to get to the top and it’s even harder to stay there. What is being subtly portrayed by the media is that a person with a disability should be given an opportunity to score a touchdown or make a basket because they are disabled and would not have the opportunity because of their disability. This is not true. There are places and programs nationwide that provide opportunities for competition for athletes with physical and intellectual disabilities. Hopefully, there are even more opportunities to come at a high school and collegiate level with the Dear College letter bringing awareness to section 504 of the 1973 Rehabilitation Act. So, what can be done now? What can you do to change the mindset from “warm and fuzzy” to athletic accomplishment? First decide if athletes with disabilities want to change this? I do. I believe education is the first step. Whenever anyone comes across an article where inappropriate language is used to describe people with disabilities please refer them to person first language resource material. If you truly want to learn about a culture then you would know it’s language. Also, if you are a person that wants to have a career in Occupational and Physical Therapy, Sports Information or Broadcasting/Communication, please take the time to volunteer at a facility that provides recreation and/or competitive opportunities for people with disabilities. This can provide an invaluable hands-on experience of being involved and aware of disability culture. At the end of the day, yes, the media wants a sensationalized story on a person with a disability. But while we are sitting at this table of sensationalism, let’s remind the media that there is also a bigger story and an even bigger picture of an opportunity to enlighten a society and to change the mindset of a nation. It’s not because of a disability that I succeed, it’s because I have put in the work and earned the right to compete in order to win. Allow me to reintroduce myself.